In the late 1930s, our Grandfather, Irv Bliss, was drawn to Mendocino County by its beautiful rolling hills and unspoiled land. He found himself on Old Toll Road looking out over a picturesque ranch that he dreamed of acquiring. Years later, Irv heard of a Mendocino property for sale. He gathered all his savings and headed to the auction to bid on the property sight unseen. As fate would have it, the land Irv purchased was the original 450 acre ranch that captivated him. Sixty years later, we carry Irv’s love for the land through our third generation of family farmers. We celebrate the land Irv passed on to us by showcasing the rich fruit we grow on our property and putting our own Bliss into every bottle of wine we produce. 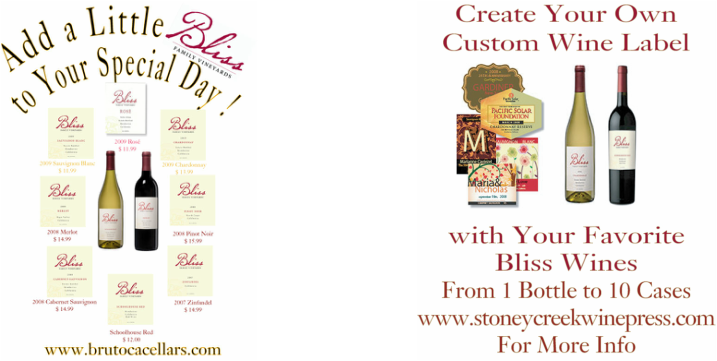 Now you can also enjoy a little Bliss on your special day ! Check our our Custom Wine Label program create your own unique wine label to add that personal touch at your event...makes great gifts too !